It really is the end of the earth. Where after a hard fought battle, the tired and rugged land gives way to the angry swirls of the Southern Ocean. The jagged rocks of the Andes Mountain range tumble downwards, collapsing into icy fields that crash into the thunderous seas. 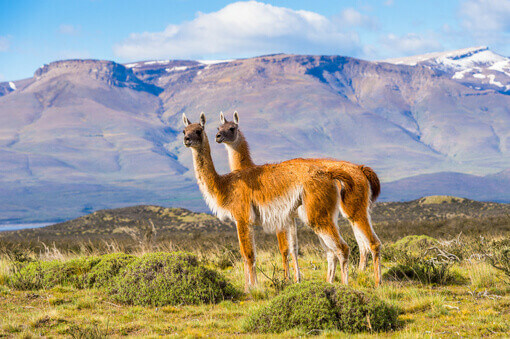 At times, the Andes foothills turn into arid deserts or grassy plains – devoid of human life, but alive with wildlife, evolved over millennia to survive and thrive in this inhospitable terrain. 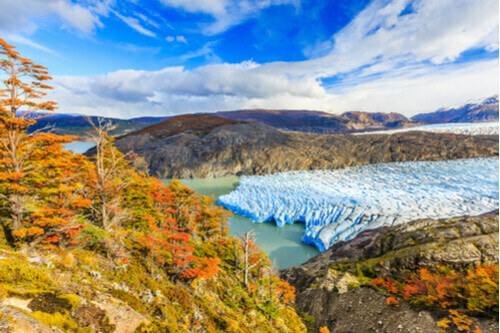 Patagonia sprawls over three-quarters of a million kilometres of Chile and Argentina, flanked on each side by the Atlantic and Pacific Oceans with the Southern Ocean beneath it. The southern-most tip of Patagonia – Cape Horn, known as the Sailors’ Graveyard for its treacherous, violent waters – reaches out towards the frozen white wasteland of Antarctica. The Patagonian Steppe stretches from Argentina’s Atlantic coastline to the tall jagged peaks of the Andes Mountains. It falls into dry desert on the Chilean side of the mountains before reaching the Pacific Sea. Each diverse topographic area creating a unique habitat for the wild animals that live, hunt and play there. Due to the harsh climate and natural barriers, there is a relative low human population density and the impact on farming has been minimal, further allowing the 500 types of wild animal to thrive. As hunting is now tightly controlled, many species of animals that were once on the brink of extinction have returned to their natural habitats and a number of vast national parks have enabled eco-tourism to thrive, bringing with it much needed economic support, without impacting the environment and its inhabitants, that those very same visitors have come to see. Low grassy steppes, hills and plateaus make up much of Patagonia. It is here that the Gauchos – south American horsemen – built communities and frontier towns on the cinematic landscape. As well as small animals like birds and mice, there are a number of types of deer that live on the Patagonia steppes, such as the southern pudu – the world’s smallest deer at just 32 centimetres tall. Their thick brown fur, black eyes and nose, and rounded eyes, makes them look part deer part teddy bear. The larger South Andean deer, known as the huemul, live further south and are able to live in more rocky terrain, eating grasses and roots from scrubland in the mountain region. These deer are perfect for birds of prey and larger mammals to feed on. The top predator and the king of Patagonia is the puma. These large cats are agile hunters and feed on pudu, huemul and even small guanacos and can often be found in Torres del Paine National Park and the Aysen region. Pumas were almost hunted to extinction but well-enforced rulings to safeguard these endangered animals has enabled them to return in good numbers. Another cat that lives at the lower altitudes of Patagonia is the pampas cat that live in the dry forests and long grasses of the steppes. These beautiful furry felines can be identified by the dark lines on their cheeks and usually coloured reddish-brown or reddish grey. Although not endangered they are rarely spotted, meaning little is known about them. Native to the Andes foothills are the guanacos, assumed to be a subspecies of the domestic llama, the guanaco are graceful beasts that can survive in dry semi-desert conditions, and have evolved to have highly efficient oxygen-absorbing blood that allows them to live comfortably at altitudes of over 4,000 metres. Many can now be spotted on the island of Tierra del Fuego National Park where there are fewer pumas to hunt them. They can be found in huge groups of hundreds and travel in large packs, meaning nearly every visit will guarantee a sighting. Another cat that hunts in the mountains is Andean Mountain Cat. This small cat is not much larger than a domestic cat and is thought to number only in the thousands. They are found usually at very high altitudes and their grey coats keep them well disguised meaning that only the most determined can catch a glimpse of the elusive felines. 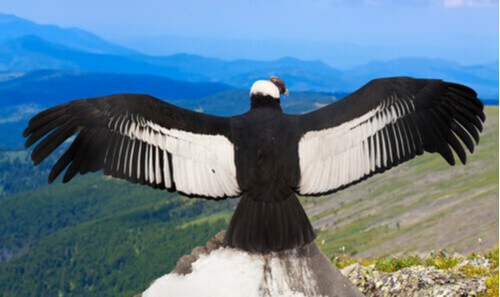 Easier to spot, is the majestic Andean condor. The world’s largest bird species, these graceful rulers of the sky have wingspans of over three metres and can live over 50 years. They are often spotted soaring over the high mountain peaks of the Andes. There are plenty of birds of prey to observe in the region, including hawks, kestrels and eagles but the Magellanic Horned Owl is the one that Harry Potter would be proud to have on his shoulder. The only owl species with ‘ears’ (which are in fact feathered crests) it is this owl species that give owls their wizened old teacher image. The Magellanic Owls can be seen all the way along the Andes and into Patagonia where they live off small mammals and birds. Torres del Paine National Park in the south is a UNESCO World Biosphere Reserve that sees 17 hours of daylight in summer. A highlight here is Lake Grey – an understated name for this vibrantly coloured lake. A slowly falling glacier that leaves floating icebergs and ice sediment on the lakes surface – turning into a fantastical panorama. Brave souls kayak through these great lumps of floating ice but it’s easiest seen by boat. An early start at sunrise will bring to life the horns of the Torres del Paine massif in red and purple glows. Here, by the ice, the small Patagonian Grey Fox hunts for birds and snacks on fruits and berries. The slightly larger Fueguian Fox – recognisable for the red fur on its head and feet – also can be spotted in the icy regions. And of course the ever present puma, constantly on the hunt. 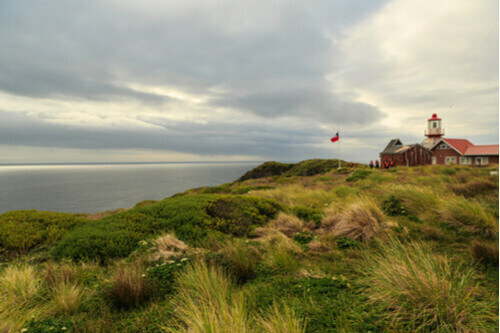 Patagonia is the only place on earth flanked by three oceans, the Pacific, Atlantic and Southern Oceans all come crashing together at the southern tip of the continent, bringing with them all manner of whales including the elusive killer whales. 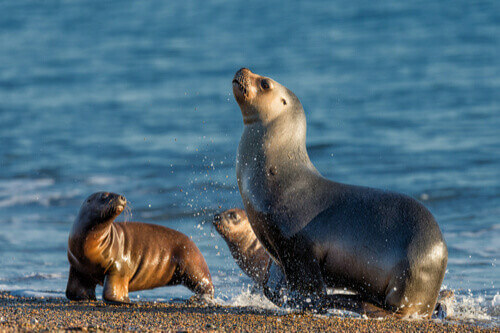 The Valdes Peninsula is where whales can be spotted as they make their migration and from a cruise ship heading towards Antarctica you can spot seals, sea lions and dolphins. On the coast, penguins galore can be found, including the King Penguin, the Humboldt, the Gentoo, and the Southern Rockhopper to name but a few. However, it is the 1.7 million pairs of Magellanic penguins that a visitor is most likely to encounter, named after the Portuguese explorer who first circumnavigated the globe and found these penguins back in 1519.